Organic food is extremely popular and everyone wants to know about their benefits. The sweeping public opinion that organic food is healthier than conventional food is quite strong, and is the main reason for increase in its demand in its demand over the past 5-6 years. 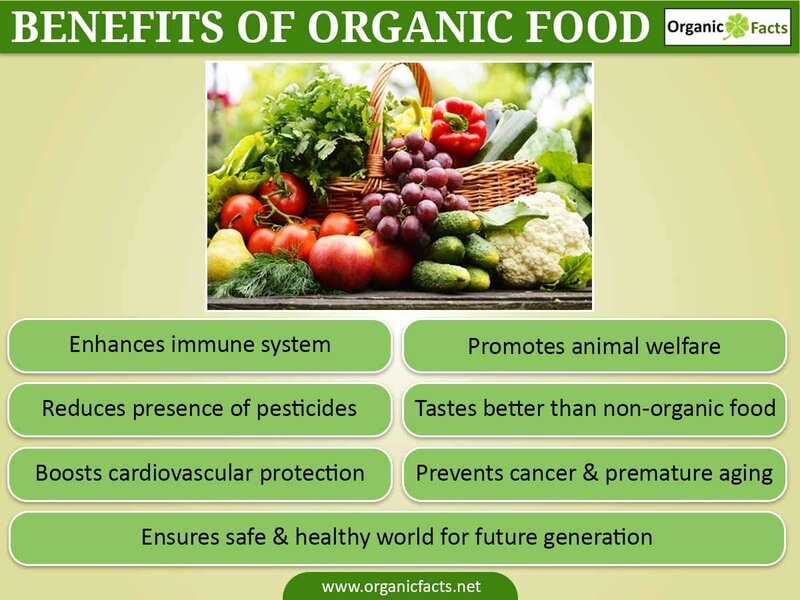 Organic Facts is a strong proponent of organic food; however, this website also believes in putting across the most accurate facts to its visitors. This article will explain what organic food is, how it is beneficial and what are the standards for the same. This is to substantiate the public opinion that we have on organic food being good for the health. First of all, there is a small amount of scientific evidence to show that organic food is better in quality than conventional food. Scientific research conducted thus far on various organic food items has not been able to give strong evidence about the superiority of organic food over non-organic food. This is more so because bulk of the scientific research is based on funding provided by the governments and industry. As a result, even the FDA and the USDA clearly mention that non-organic food is as healthy as organic food. However, there are some scientific studies that have proved organic milk and organic tomatoes to be better than the non-organic varieties. Studies are also ongoing about a variety of other types of organic food that may have additional health benefits compared to the non-organic varieties. Recent research conducted on organic milk has shown that it has more antioxidants, omega-3 fatty acids, CLA, and vitamins than non-organic milk. According to the researchers at the Danish Institute of Agricultural Research at the University of Aberdeen and the Institute of Grassland and Environmental Research, organic milk is healthier than non-organic milk, since organic cows are pasture grazed which results in the better quality of milk. According to a 10-year study conducted by the University of California, Davis, organic tomatoes are produced in an environment that has a lower nutrient supply since nitrogen-rich chemical fertilizers are not added. This leads to an excessive formation of antioxidants, such as quercetin (79% higher) and kaempferol (97% higher) in organic tomatoes. As we all know, antioxidants are good for health and help in reducing heart disease and the chances of developing cancer. These studies have increased the hopes of numerous people who strongly believe that mankind should stop using chemical fertilizers and pesticides and shift to more sustainable organic farming practices. There are many studies that prove that there is some pesticide and fertilizer contamination in non-organic food, and there are others which claim that organic food is not healthy because they contain harmful bacteria and viruses because of not using strong chemicals to protect against these toxic substances. However, none of these studies that show chemical contamination or the presence of bacteria/viruses show any direct impact on the overall health of individuals. In general, organic food consumers, manufacturers, and farmers strongly believe that organic food has the following benefits compared to conventional food. A number of studies have been completed regarding the effects of antioxidants derived from organic foods on your overall health, and the predominant results have shown that antioxidants tend to have more of an impact when they come from organic foods. This may be due to the fact that foreign chemicals are not negatively interacting with the different vitamins, minerals, and organic compounds that are so essential for the positive impact of fruits and vegetables in the prevention of things like cancer, heart disease, premature aging, vision problems, and cognitive malfunction. Recent research suggests that choosing organic food can lead to increased intake of nutritionally desirable antioxidants and reduced exposure to toxic heavy metals. One of the major complaints that organic food consumers cite when choosing organic over non-organic is the presence of pesticides. In order to keep crops from being attacked by the natural world, including bugs, pesticides are required. Although they do a good job keeping certain pests away from the crops, they also are composed of powerful chemicals like organophosphorus. This is an unnatural mineral compound that is not required by humans, but more than 80% of this material in our bodies comes from eating pesticide-coated foods. Organophosphorus has been connected to a number of developmental problems, including autism and ADHD, so those organic food lovers do have a pretty strong argument in this case. To be fair, many people do choose to go organic to make sure that their children grow up healthy and unaffected by the toxins of the world during their developmental years. Increased amount of time grazing on grass also increases the amounts of CLA (conjugated linoleic acid) that can be found in the animal products. CLA is a heart-healthy fatty acid that can boost cardiovascular protection, and it is found in higher quantities in breast milk and in meat for animals that have been raised free range or cage-free. In recent decades, one of the biggest projects for farmers and food growers has been genetic modification. Making tomatoes six times larger might sound like a possible option for solving some world hunger issues, but there is another side to it. Genetic modification is still in its early stages, so the long-term effects of it on human health aren’t understood as well as we would like. In animal testing genetically modified food showed a major reduction in immune system strength, an increase in birth mortality, as well as in certain sexual dysfunctions, cancers, and sensitivity to allergens. Although there are some good things about genetically modified food, organic food advocates point to the lack of concrete details about the long-term effects. People are very sensitive to issues of their health, and they often take precautions to make sure they remain healthy, like getting various vaccines and taking antibiotics as soon as a new strain of bacteria makes them ill. However, non-organic food sources, particularly livestock and feed houses, also use antibiotics to feed their animals. This extra dose of antibiotics may actually be weakening our immune system by basically overdosing on antibiotics, thereby reshaping our immune system so many times that it will eventually be unable to defend itself. Organic food growers and dairy farmers do not use antibiotics in their processes. Since organic food is not prepared using chemical fertilizers, it does not contain any traces of these strong chemicals and might not affect the human body in negative ways. Natural fertilizers, like manure, work perfectly fine, and organic farmers are happy to use this smellier, yet safer, form of fertilizer. Some people strongly believe that organic food tastes better than conventional food. The prominent reason for this belief is that it is produced using organic means of production. Furthermore, organic food is often sold locally, resulting in availability of fresh produce in the market, which usually does taste better than produce that has been frozen, shipped, and transported across long distances. As harmful chemicals are not used in organic farming, there is minimal soil, air and water pollution; thus ensuring a safer and healthier world for future generations to live in. Animal welfare is an important aspect of producing organic milk, organic meat, organic poultry, and organic fish. People feel happy that the animals are not confined to a miserable caged life when they eat organic animal products. Organic food refers to food items that are prepared according to the norms set by an organic certifying body. On an overall basis, organic food is food prepared and processed without using any chemicals. That is, organic food production does not involve the use of chemical fertilizers, chemical pesticides, or chemical preservatives. 100% organic: Must contain 100% organically produced ingredients. Organic: Must contain at least 95% organic ingredients. Made of organic ingredients: Must contain at least 70% organic ingredients. Have some organic ingredients: May contain less than 70% organic ingredients. Is It Good for Health? Normally people believe that organic food is better for your health than conventional food. However, the USDA and the FDA clearly state that conventional food is as healthy as organic food. Scientific research has also not been able to conclusively prove that organic food is healthier than conventional food because there has been counter research too to prove conventional food is better than organic one. The exceptions are organic milk and organic tomatoes. Recent studies on organic milk and organic tomatoes have shown that these food products are healthier than non-organic milk and non-organic tomatoes, respectively. How Do I Know Something is Organic? Organic food can be identified with the help of an organic logo on the packet. Companies, farmers, manufacturers, and suppliers, which follow all the norms set by a certifying body of their region, can put a logo of that certifying body on their food items. Are Standards the Same for All Organic Food Products? No, since the mode of production and processing is different for different food items, the standards are also different. For example, the standards for organic honey production are different from the standards for organic milk production or organic coconut oil production. Note that the standards vary from region to region. Some countries may follow a uniform set of codes. For example, about 18 countries follow the rules set by the International Olive Oil Council for organic olive oil production. However, there are some countries such as the US, which have their own standards for organic olive oil production. Should I look for the word organic on the food item? Yes, you should look for the word “Organic”. However, you should also check the logo of the certifying body. It is illegal to sell non-organic food with an organic label. However, there have been cases of fraud before, which when brought to the attention of the authorities, have been dealt with strongly. Therefore, you should always check the logo of the certifying body properly and you should buy organic food items that have an authentic label on them. Does organic food cost more than conventional food? Yes, organic food normally costs 20% to 100% more than conventional food. 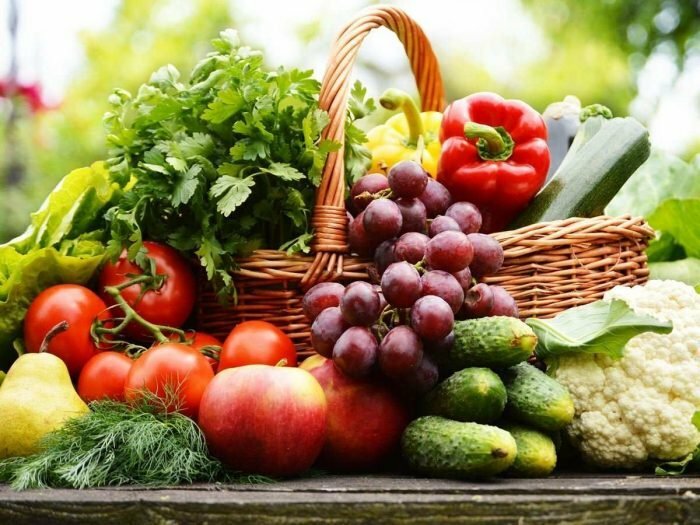 Organic food production is generally labour-intentsive and involves the use of organic fertilizers and organic pesticides, which are more expensive than chemical fertilizers and pesticides. That is why it costs more. You can also produce organic food in your garden, organic gardening is a very common hobby for many people. you do not need any permission to produce it. However, if you intend to sell organic food, you need to follow the guidelines set by a certifying agency and get approval from them for using their logo. Is organic food the same as natural food? No, organic food refers to food items prepared without using chemicals. Natural food refers to food items that are only minimally processed. Many parents believe that organic food is safer for their children, since it does not contain any chemical pesticides and fertilizers. However, there is no scientific research to prove this. Does it contain more nutrients? So far, scientific research has proven this only for organic milk and organic tomatoes. Organic milk has more omega-3, CLA, vitamins, and antioxidants than non-organic milk. Similarly, organic tomatoes have more antioxidants than non-organic tomatoes. Recent research suggests that choosing organic food can lead to increased intake of nutritionally desirable antioxidants and reduced exposure to toxic heavy metals. The content in this website is for information and educational purposes.